Introducing a favourite classic E-Liquid with a brand new look, this short fill never fails to satisfy your taste buds. 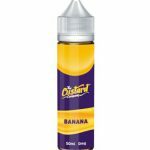 A smooth velvety rich custard with a splash of vanilla to give you a satisfying all day vape. Our in-depth steeping process provides the best Vanilla flavour around!